Alana Kennedy scored from midfield to lift the Orlando Pride over the Washington Spirit 1-0 at Maureen Hendricks Field Maryland SoccerPlex in Boyds, Maryland on Saturday night in Week 13. The Orlando Pride are now unbeaten in their last six road games and have lost just once in their last ten games. The Pride secure second place in the league standings with 22 points and a 6-3-4 overall record. The Spirit are winless in their last five games and drop to 2-8-4 overall with the loss at home. Kennedy put the Pride on the board in just the 11th minute when she intercepted a poor square pass by the Spirit in the midfield. Kennedy took a couple touches after winning the ball then struck it from inside the center circle, noticing Spirit goalkeeper Aubrey Bledsoe way off her line. Kennedy’s shot soared over Bledsoe and gave her team the early 1-0 lead. The Pride and Spirit battled it out through the remainder of the first half with the Pride seeing the better of the offensive chances. Christine Nairn was crucial in the midfield for the Pride playing dangerous balls over the Spirit’s backline to Pride forwards Alex Morgan, Sydney Leroux and Chioma Ubogagu. In the 26th minute, Nairn, who leads the league with assists this season (4) won the ball and immediately lifted up her head and served a through ball into space to Morgan down the right wing. Morgan collected the ball and dribbled centrally where she got a shot off, but it went wide. 26' | @NairnChristine drops in a quality pass to @alexmorgan13 on the break. The resulting shot goes off target but a good idea! Morgan finished the game with two shots, one on target and one key pass. Nairn had three key passes on the night and won possession for her side seven times. The Spirit’s best opportunities sparked from forward Ashley Hatch. Hatch finished the game with a team-high five shots and made two key passes. In the 34th minute Hatch got herself in a dangerous position in the box and was able to get her foot on a Taylor Smith cross. The Spirit battled through the second half looking to break through for the equalizer, but the Pride were solid in the back with goalkeeper Ashlyn Harris coming up with big saves. Harris earned the shutout on the night and made three saves. Harris has 39 saves this season and picked up her fourth shutout this year. On the other end of the pitch, Bledsoe made one save on the night in the loss. The Spirit had a solid run of play in the 66th minute, where midfielder Tori Huster combined with Meggie Dougherty Howard at the top of the box. Dougherty Howard played it outside to Smith, who took a shot that went just over the bar. Harris’ biggest save of the night against the Spirit came in the 83rd minute when she made a diving stop against a blast from Spirit defender Caprice Dydasco. The Spirit dropped the points at home, however finished the game with a slight advantage in possession with 50.6% to the Pride’s 49.4%. The Spirit were also strong defensively in the efforts of Estelle Johnson, who finished the evening with four tackles, four clearances and one interception. Johnson now has a league-leading 72 clearances on the year. The Pride will enter Week 14 with a midweek clash at home vs. the Houston Dash on Wednesday, and the Spirit will look for a road win when they travel to Chicago to face the Red Stars on Sunday, July 1. Match ends, Washington Spirit 0, Orlando Pride 1. Second Half ends, Washington Spirit 0, Orlando Pride 1. Offside, Orlando Pride. Alex Morgan tries a through ball, but Marta is caught offside. Attempt saved. Caprice Dydasco (Washington Spirit) right footed shot from outside the box is saved in the bottom right corner. Assisted by Ashley Hatch. Substitution, Washington Spirit. Tiffany Weimer replaces Rebecca Quinn. Attempt missed. 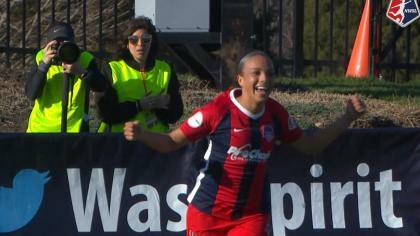 Francisca Ordega (Washington Spirit) right footed shot from outside the box misses to the right. Assisted by Caprice Dydasco. Substitution, Orlando Pride. Toni Pressley replaces Christine Nairn. Attempt missed. Caprice Dydasco (Washington Spirit) left footed shot from outside the box is high and wide to the left. Assisted by Andi Sullivan. Attempt missed. Andi Sullivan (Washington Spirit) right footed shot from the centre of the box is too high. Assisted by Tori Huster. Attempt blocked. Rebecca Quinn (Washington Spirit) left footed shot from outside the box is blocked. Assisted by Andi Sullivan. Substitution, Orlando Pride. Marta replaces Emily van Egmond. Attempt missed. Francisca Ordega (Washington Spirit) left footed shot from a difficult angle on the left is close, but misses to the left. Assisted by Tori Huster following a fast break. Offside, Orlando Pride. Christine Nairn tries a through ball, but Poliana is caught offside. Attempt missed. 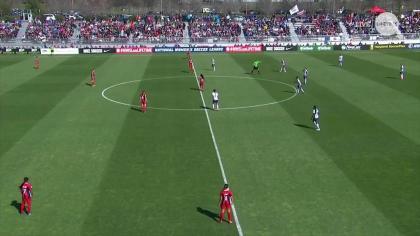 Taylor Smith (Washington Spirit) right footed shot from the right side of the box is just a bit too high. Assisted by Meggie Dougherty Howard. Attempt blocked. Chioma Ubogagu (Orlando Pride) left footed shot from outside the box is blocked. Assisted by Christine Nairn. Substitution, Washington Spirit. Meggie Dougherty Howard replaces Joanna Lohman. Offside, Orlando Pride. Alex Morgan tries a through ball, but Sydney Leroux is caught offside. Delay in match Alanna Kennedy (Orlando Pride) because of an injury. Attempt missed. Ashley Hatch (Washington Spirit) right footed shot from the left side of the box misses to the right. Attempt missed. Francisca Ordega (Washington Spirit) right footed shot from outside the box is close, but misses the top right corner. Assisted by Joanna Lohman. Second Half begins Washington Spirit 0, Orlando Pride 1. First Half ends, Washington Spirit 0, Orlando Pride 1. Attempt saved. Joanna Lohman (Washington Spirit) header from the centre of the box is saved in the centre of the goal. Assisted by Andi Sullivan. Attempt missed. Joanna Lohman (Washington Spirit) right footed shot from outside the box misses to the right. Joanna Lohman (Washington Spirit) wins a free kick in the attacking half. Attempt missed. Emily van Egmond (Orlando Pride) right footed shot from outside the box is close, but misses to the left. Assisted by Alex Morgan. Attempt blocked. Alex Morgan (Orlando Pride) left footed shot from the centre of the box is blocked. Assisted by Sydney Leroux with a headed pass. Attempt missed. Ashley Hatch (Washington Spirit) right footed shot from the centre of the box is too high. Assisted by Francisca Ordega. Attempt missed. Alex Morgan (Orlando Pride) left footed shot from outside the box is high and wide to the left. Assisted by Christine Nairn. Attempt missed. Ashley Hatch (Washington Spirit) left footed shot from the right side of the box is too high. Assisted by Tori Huster. Sydney Leroux (Orlando Pride) wins a free kick on the right wing. Attempt blocked. Joanna Lohman (Washington Spirit) right footed shot from outside the box is blocked. Goal! Washington Spirit 0, Orlando Pride 1. Alanna Kennedy (Orlando Pride) right footed shot from more than 35 yards to the bottom right corner. Attempt missed. Ashley Hatch (Washington Spirit) left footed shot from the centre of the box is too high. Assisted by Francisca Ordega. Attempt blocked. Emily van Egmond (Orlando Pride) right footed shot from outside the box is blocked. Assisted by Christine Nairn. Attempt saved. Alex Morgan (Orlando Pride) left footed shot from outside the box is saved in the centre of the goal. Assisted by Sydney Leroux.